VELYKA NOVOSILKA, Ukraine — About once a week, Leonid Sholkovsky has a reccurring dream about the battlefields from which he collects the remains of fallen Ukrainian soldiers. 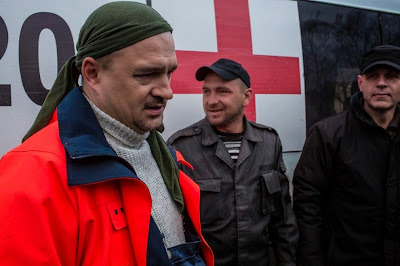 Ihor Slyusar, Yevheny Kishkin and Serhei Tkalenko in front of an ambulance. In the dream, a young fighter is walking toward Sholkovsky, stepping over the twisted scraps of military vehicles and dead soldiers strewn across the blackened fields of eastern Ukraine. The solider has a helmet on, and there is a blue and yellow patch on the shoulder of his camouflage jacket, so Sholkovsky knows the soldier could be one of the dozens of Ukrainian men he has sent home in a body bag over the last six months. What Sholkovsky doesn’t understand is why the young solider is shaking his finger at him. “He’s either trying to warn me of something, or telling me not to finish what I’m doing,” Sholkovsky said. Few would envy Sholkovsky’s work, not least because of the nightmares that come with it. The 44-year-old mechanic from Kiev is part of a squad of 30 calling themselves the Black Tulips, a volunteer group whose teams cross enemy lines to recover the remains of Ukraine’s lost soldiers from the frontlines. Their work is dangerous and logistically complicated, often requiring the teams to work in trenches and fields littered with mines and unexploded shells. To get to the bodies, they sometimes work in the direct line of fire. They do this thankless task, the volunteers say, so the soldiers’ families can bury their loved ones. “This is our contribution, the best way we can help in this horrible war,” said Ihor Slyusar, 40, an economist from Kiev who works in the same four-man Tulip team with Sholkovsky. A year has passed since Ukraine’s war against Russia-backed separatist rebels started in the country’s east, and it’s hard to quantify how drastically things have changed. Ukraine had enjoyed 23 years of peace since the breakup of the Soviet Union, and war was something very few ever believed would be fought on the country’s fertile, black soil. But heavy artillery and shelling in the east has claimed more than 6,200 lives, including nearly 2,000 Ukrainian soldiers. An estimated 1.2 million Ukrainians have been displaced by the war. A year ago, Sholkovsky and his teammates were just “regular Ukrainians” who had a deep interest in World War II history, and in particular, that war’s battlefields across the former Soviet Union. All four of the men, and many other Black Tulips, were members of a group known as the National Memory Union, which scoured World War II battlefields for the remains of unidentified soldiers. The actual number of soldiers killed from 1941-45 far surpassed the official statistics, and the National Memory Union volunteers were determined to return those left behind to their families, even if it was 70 years late. Today, the Black Tulips’ mission is no longer historical. They search through the remnants of bombed out tanks, blown-apart armored personal carriers and blackened sunflower fields in eastern Ukraine, looking for their compatriots who, like them, probably never thought that they’d see such a brutal war fought in post-Soviet Ukraine. “Sometimes you get to a battlefield, and you can’t believe it’s 2015,” said Serhei Tkalenko, 50, another one of Sholkovsky’s teammates. The Black Tulips formed in September 2014, when members of the National Memory Union got an unusual request from the Ukrainian Ministry of Defense. A bloody battle between the rebels and Ukrainian forces for control over a strategic hill known as Savur-Mohyla had raged for weeks during the summer. At the end of August, the territory fell under rebel control. Dozens of dead Ukrainian soldiers had been left behind when their units retreated, and the Ministry of Defense needed help retrieving them since the rebels would not let Ukrainian officials into their territory. The Black Tulips got to work, and adopted a name of a former Soviet cargo plane used to remove soldiers’ bodies from Afghanistan. At Savur-Mohyla, the volunteers set about a gruesome task. Tank battles, mortar shells and heavy artillery had killed scores of men and left them literally scattered across the streets of small towns and crop fields. Instead of the whitened skulls and bones of World War veterans, the Black Tulips were searching for soldiers killed sometimes just days before. The smell was horrific; the conditions of the bodies sometimes unimaginable. Too often, wild animals and stray dogs would get to the soldiers’ remains before the volunteers. “We all go through those initial emotions of thinking there’s no way we can do this the first time we see a body,” Slyusar said. Since that first search in September, the Black Tulips have recovered more than 300 bodies. They do it for free and without support from the Ukrainian government. Their supplies, including the refrigerator trucks used to bring out the bodies, are all donated. Often, negotiating with the leaders of the self-declared Donetsk People’s Republic to let them cross enemy lines and retrieve the bodies is complicated and riddled with political tensions and suspicions. The Black Tulips must delicately balance their support for Ukraine with the necessity of their volunteer work. Once they cross into rebel-held areas, an armed rebel jumps in the van with the volunteers and rides with them until they reach the site where they will begin collecting and bagging the dead soldiers. From there, the rebel stands guard. “We try and keep the conversations simple, you know? We talk about the weather, cars, what we did before the war,” said Yevheny Kishkin, 31, the driver for Slyusar and Sholkovsky’s group. Retrieved Ukrainian bodies are taken to government-controlled areas, where the Ministry of Defense begins the arduous process of identification. While hundreds of Ukrainian wives and families have buried their sons and fathers, there are still hundreds more who are waiting for the results from the country’s overwhelmed and under-equipped DNA facilities. In late October 2014, the Black Tulips were sent to collect bodies that rebels said were scattered south of the town of Snizhne, where fierce tank battles had taken place in August. Rebels said there were hundreds of dead Ukrainian soldiers left behind by their units. Many of the bodies were badly decomposed, and some of them difficult to find. There were mangled tanks everywhere. One of the tank’s gun turrets had been blown off by a mortar shell with such force that it lay some 10 feet from the destroyed tank’s frame. The Black Tulips recovered one body from underneath the turret, then began combing through the nearby fields for more. Several yards away, they came across the bones and tattered pieces of a military uniform of a soldier. A voter registration card dating back to May last year lay in a pile of what was left of his belongings, the only clue to his identity. Sholkovsky put the remains in the body bag and noted their location and scant details in the paperwork for the Ministry of Defense. The soldiers found three other bodies that day, all from the same 30th Mechanized Brigade based in Novohrad-Volynskyi. A local farmer who had seen the volunteers loading body bags into their refrigerator truck said he knew where there were more. The elderly man had buried them himself in a nearby field month before in an attempt to give the soldiers some sort of dignity in death. The Black Tulips followed the farmer to the area and uncovered the body of a 33-year-old draftee, whose military documents had been tucked into the armored vest he was still wearing. It was a traumatic and grueling day for the Black Tulips, but a day they knew would change the lives of these men’s families forever. “It takes me about a week to get back to normal after we’ve finished our shifts out here,” said Tkalenko, who was one of the Black Tulips to find the soldiers from the 30th Mechanized Brigade that day.